On Thursday, October 15th UCLU Green Economy was thrilled to host James Greyson as our first guest lecturer of the year. James has over 20 years of experience in the sustainability sector- he is the founder and head of the influential Blindspot Think Tank that is advising businesses, NATO and international NGOs on complex system change. At our lecture he talked about circular economy, which he believes is a good case study of how we can create systemic change. Change which can then be used to address complex global problems. He began his lecture by depicting the ‘streetlight effect’- the idea that when we lose our keys, we don’t look for them where we dropped them but where the light is shining. The ‘streetlight effect’ represents our way of thinking as a society- we tend to not go for sensible solutions to problems but to the ones that seem the most obvious to us initially. Furthermore, our traditional way of looking at sustainability problems is to separate them and deal with each problem individually. Circular economy, however, would allow us to solve them all in one go. In other words, the very concept of circular economy could solve the whole linear economy problem. It would radically alter modern economics and society as a whole, thereby providing solutions to all the individual problems at once. Take waste for example. Our standard definitions of waste tends to revolve around waste being something solid that people want to get rid of. In a circular economy, we are not looking to get rid of waste but also at what happens after we get rid of waste. James Greyson’s suggestion is dealing with waste not after disposal but before disposal. This is known as ‘precycling’. Precycling consists in shifting the emphasis onto an earlier stage of the life cycle so that the producer receives greater responsibility. Businesses, governments, households and communities can all precycle – every product can be precycled in some way. However in order to get everyone on board with precycling, we need to create a movement around the change and make everyone aware of it. Alternatively, we could also look at the role of the economy in creating this change. Since linear economy is a failure of externality, we can extend the practices of producer responsibility insurance by assigning each company with a “wasterisk” -the risk or likelihood of a product ending up as waste in ecosystems. The idea is that currently, there is no incentive for producers to do anything about the waste risk of their products, due to lacking financial incentives. If we make producers responsible for the waste risk of products and extend the idea of product waste insurance, we could use premiums to cut risks everywhere throughout our society. In particular, we could spend it on activities that create a smooth transition to a circular economy. But this is only one of James’ numerous revolutionary initiatives. James then discussed reductionism, or ‘shrinking-thinking’, which is a habit of thinking that has been with our society since the enlightenment. We look at global problems by reducing them or breaking them down into parts, as a reduced problem seems more manageable to us. This gives us the illusion that we are contributing to solving the big problem and that all of these small changes will add up one day. This is known in psychology as a reward system. However is this really the case in reality? James argues that instead of continuing with reductionist ways of thinking, we need to replace our current destructive self-organising and self-reinforcing system to a restorative one. In order to achieve this ambitious aim, we need what James calls ‘Planet Levers’. 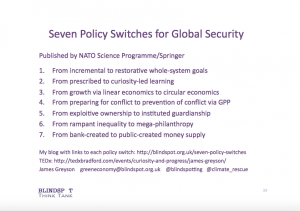 These 7 policy shifts (see picture above and below) would fundamentally reshape our conventional societal system. 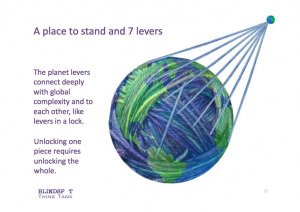 James concluded that today every planet lever is set in the wrong position so the global problems are set to worsen but reassured us that if all planet levers are shifted in time, we could still unlock a secure future for everyone. 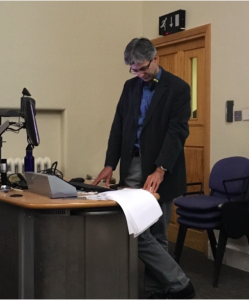 We would like to thank James Greyson for his insightful lecture on blindspotting and circular economy and to everyone who attended the lecture, we hope you enjoyed it as much as we did! You can find James Greyson’s slides here and watch his talk on our youtube channel.